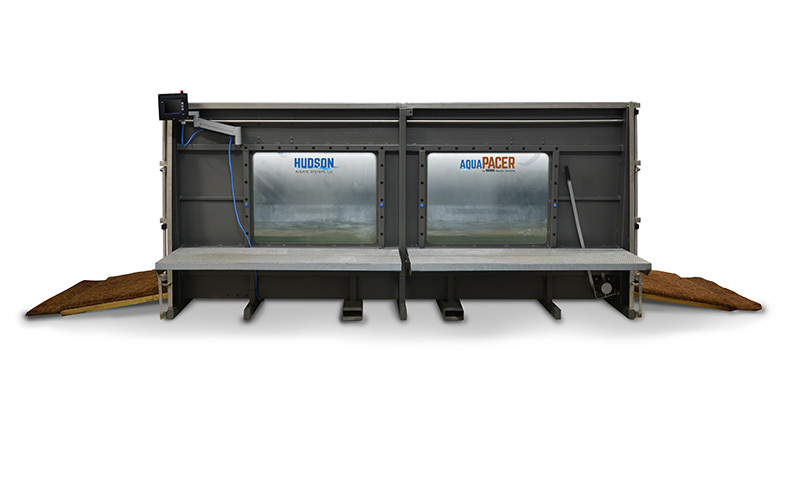 Hudson Aquatic’s AquaPacer Plus is designed for the advanced development and improvement of equine athletes of all disciplines by offering low-impact, high-resistance therapy or workouts for faster recovery and rehabilitation from injury, optimal training and conditioning, and overall performance and fitness. The AquaPacer Plus aquatic underwater treadmill unit offers more control with hot and cold water temperature, water height (to control buoyancy and resistance), speed and duration along with better views from windows and platforms on both side. Equine trainers and veterinarians can utilize AquaPacer Plus to customize a protocol for each equine’s specific needs. In addition, our underwater treadmill is commonly used for healthy equines needing more strength or endurance or to help correct gait imbalances. The AquaPacer Plus will promote rapid build-up of muscle across the shoulders, hind end, and top line of the equine, as well as improve circulation and decrease inflammation. Contact Us to find out more about the AquaPacer Plus. • Other Components: Pre-filter system on the drain, switch to go from one water supply to the other. General Specifications are rounded to the nearest whole number. Metric conversions are calculated before rounding the U.S. measurements. Specifications may change without notice.